Ismaili geets/spiritual/religious..... Aha !! Both of us (KAMAL & MYSELF) said almost at the same time……..”MERE MOWLA” was waiting to be released at the “GOLDEN MOMENT”..... & Yes ! It definitely did.....Shukar to the ALMIGHTY & MHI, ameen, ameen. 4. Mere Dil Main Tuhi Tu Mowla-go For the Gold ! 7. Aaoon Aaoon Karim Shah-happy Golden Jubilee ! & Yes ! It definitely did.....Shukar to the ALMIGHTY & MHI, ameen, ameen. Kamal Taj & Myself (ENOO) started working on a CD project in the SHAAN of MOWLA around the end of 1999 & henceforth sang as many songs completed in various functions of “KHUSHYAALI” performances for ex. In the Council meetings Program in Chicago, then Phoenix,AZ the “KAMAL TAJ & ENOO’s Music” Show, around the USA, etc., etc. Unfortunately either Kamal was switching his Work Position OR I was relocating to another State & it never happened until around Dec/2006 when we spoke to each other & with KAMAL TAJ being on a Contract in DOHA, QATAR & myself relocated to Golden, COLORADO........is when we decided on FINALLY putting this project together for release……. We knew & said: Aha !! Both of us (KAMAL & MYSELF) almost at the same time……..”MERE MOWLA” was waiting to be released at the “GOLDEN MOMENT”.....& Shukar HI……IA……,ameen, it did. So PLEASE enjoy the tracks of “MERE MOWLA” which has an Outstanding Feedback & an Overwhelming Response from listeners from all over the Globe. This CD ATTRACTS ALL GENERATIONS simply because of it's VERSITALITY of MUSIC & SONGS/VOICE EXPRESSIONS, etc., making it very UNIQUE & DIFFERENT from the REGULAR fashion of ISMAILI GEETS. Best wishes and prayers from Calgary Canada. Hi Enoo and Kamal Taj.YAM,this CD is fantastic.I am still listening and trying to remember all geets.I still remember the ALAHUMA SALE ALLAH version that kamal Taj sang i really love that portion.KEEP IT UP.YOU GUYS ARE GREAT,MAY MOWLA BLESS YOU.KEEP IT UP THE GOOD WORK.GOLDEN JUBILEE MUBARAK.LOTS OF LOVE AND PRAYERS. YOU ARE THE BESTEST !! Excellent! Wishing you a lot of success. Enoo I just LOVE YOUR Album. My prayers are always with you all. 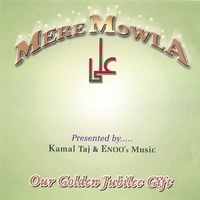 chaman main deedawar paida "
"MERE MOWLA" ....presented by KAMAL TAJ & ENOO's Music is definitely a great album. I especially enjoyed listening to & like the title track Mere Mowla and also the other following Golden Jubilee songs which are superb. Great music & quick responses to queries also. Two GREAT ARTISTS and SINGERS-MARVELLOUS job !! Wonderful compositions and soul touching geets of the Golden Jubilee of our Beloved Imam, Mowlana Shah Karim Al-Huseini Hazar Imam. Two great artists and singers- You have done such a marvellous job. May Mowla give you lots of Barakat, happiness, success in all your endeavours. Amen Amen. "ENOO's Music" is very endearing and truly enjoyable - Congratulations! Please can u tell me from where I can download the new golden jublee album which u n Sir Kamal Taj has released.. I m a big fan of urz.... I visited ur website for the first time. Can u please send me the golden jubliee album ..OR Please guide me from where I may download this beautiful creation of yours Sir ENOO. Awaiting eagerly for ur early response. I really love ur music. \"ENOO\'s Music\" is very much refreshing and I love to listen to your soul filling music early morning. Thanks and Wish u all the best !! p.s. I am the HP Level 2-Supervisor who spoke to u just yesterday.